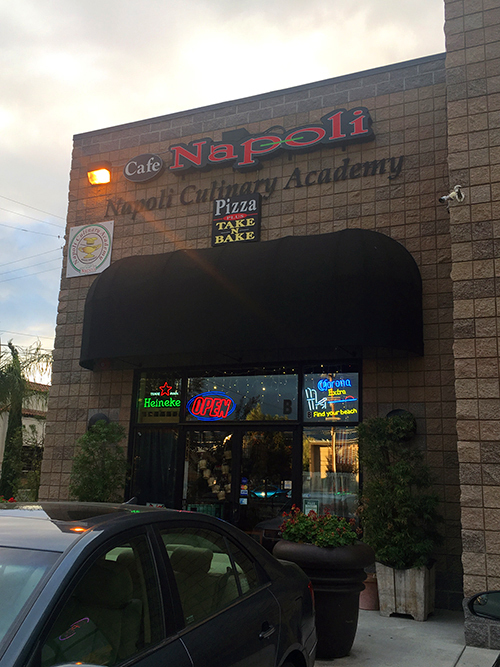 Classes at the Napoli Culinary Academy popped up on Groupon over the summer. A girlfriend and I were having dinner and decided it would be fun to sign up for one. Classes fill up fast, the first “Art of Pizza Making” session with two seats available was four months out. Perfect, that worked with both of our schedules. 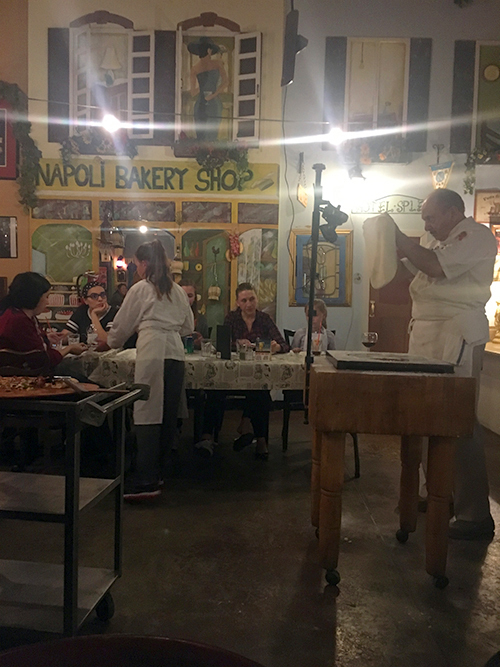 Napoli also hosts a “Cooking with the Movies” series of classes where they teach students how to cook dishes inspired by favorite movies. 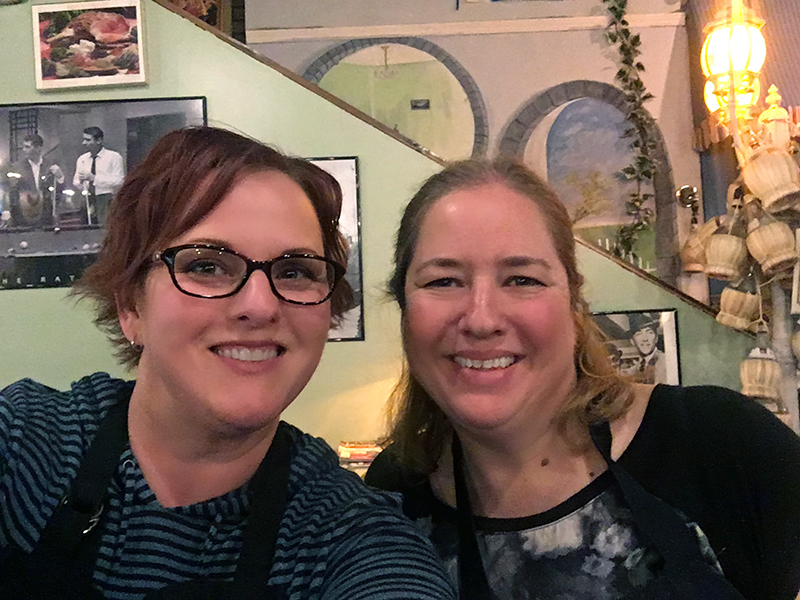 Example: Gone With the Wind: Three Course Southern Class where students make Sweet Southern Cornbread, Chicken Brunswick Stew and Peach Cobbler. I’ve taken three other pizza cooking classes from chefs local to Sacramento and I was excited to take a fourth at a new place. 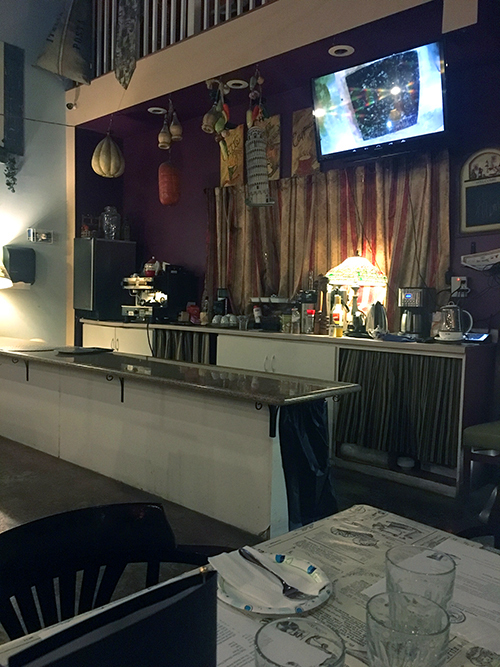 They do offer the Art of Pizza Making paired with the Teenage Mutant Ninja Turtles movie, but we opted for the no movie class. Fast forward to Friday, November 3 (the day we attended the Luke Bryan concert in the pouring rain) and being in the car when Michelle asked just after midnight – What time should I pick you up tonight for our class? Me: Huh? Class? What class? Michelle: Um… our cooking class. Did you not put it on your calendar? How about 4:30 p.m.? Laughter ensues. We walked through the door and were immediately greeted by our instructor, Chef Hassi Sadri. 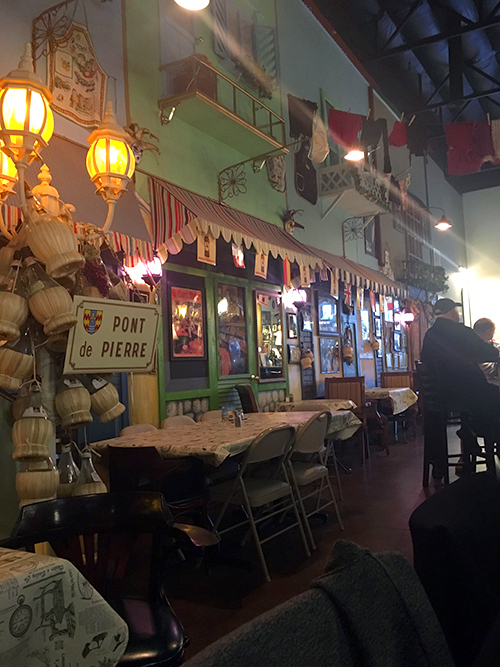 The interior was really cute. 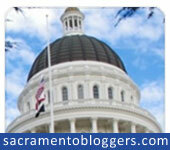 I kept comparing it to other cooking classes I had taken and I knew it would be a very different experience. The dim lighting, intimate setting and smaller instructor station intrigued me and also made me sad because I knew my photos would end up being dark/mediocre. We sat together at one of the side tables and looked through the drink menu. Our class fee included water, soda, beer or wine and tastes of all the food made that evening. We were given a dough and pizza sauce recipe to start things off. There were some introductions and then Chef Sadri demonstrated the art of preparing/throwing pizza dough. The dough recipe was similar to other recipes I’ve received or found in cookbooks and online. Bread flour, ice water, salt, butter, yeast. He stressed the importance of using a food scale, which inspired me to order a new one for myself. My trusty scale from my Weight Watcher days bit the dust a few months back. Chef Sadri tried to catch people off guard by throwing the formed dough at students while he was talking to see if we had been listening when he explained the proper way to catch formed pizza dough using the back of your hands/wrists, not your fists or fingers and definitely not while wearing rings or other jewelry. The first student did great. She nailed it with a perfect back of the hands/wrist catch. The second student stuck her entire finger through the dough and said it was because she got scared. He mocked her for a good 5 minutes after that, which I didn’t mind, because this person was the same that probably asked “is this going to be on the final?” while attending school. Translation: she was annoying AF. We learned about the importance of creating your own sauce and how all bottled, jarred or otherwise packaged pre-made “pizza sauces” are crap. Ha-ha, not going to lie, I’ve used Trader Joe’s and other brands many times. He first applied freshly chopped garlic to the raw pizza dough once formed on the pizza pan/or board. 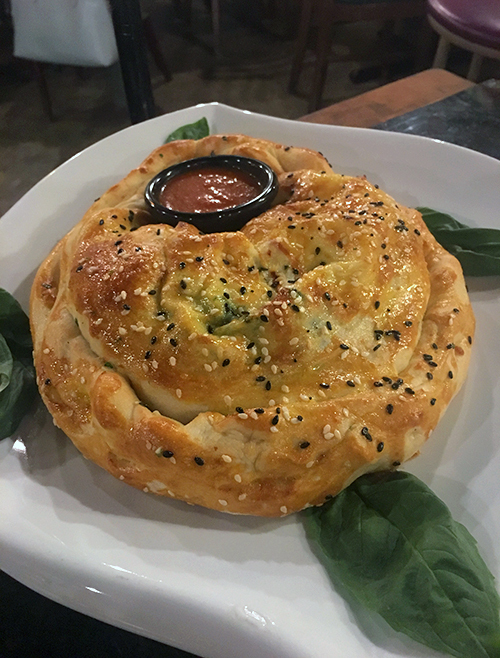 He then used a sauce combination of (crushed tomatoes, salt, pepper, oregano, garlic and optional crushed red pepper) directly on top of the garlic/raw dough. 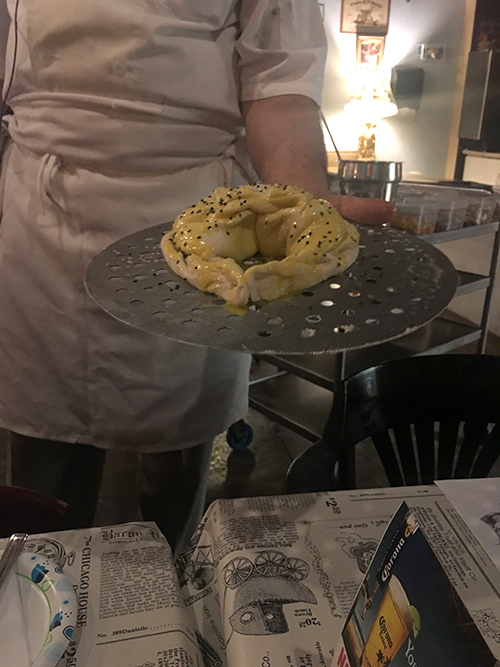 He used a ladle to spread sauce to the outer edges while leaving over an inch of space around the edges so the sauce/cheese lava flow wouldn’t jack up the pizza oven. I’m sure not his exact words, but pretty close. Chef Sadri had a lot to say about people that use too much sauce. He even sarcastically offered to bring students cups of sauce to drink so they wouldn’t flood their pizzas due to “their love of sauce.” Once the sauce was spread onto the dough, he sprinkled the pizza with more oregano, followed by a thin coating of Parmesan cheese. Then it was time for the toppings. The first pizza was a stuffed pizza. 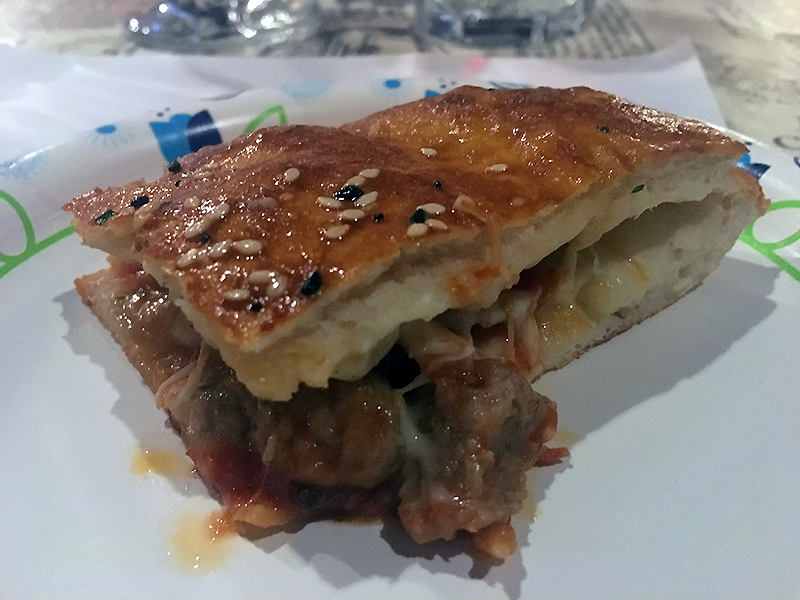 The toppings included sausage – a blend they order and actually sell at the cafe/academy, red and green onion, a three pepper (yellow, red, green) blend, mushrooms and lots of mozzarella cheese. He topped the dough with regular and black sesame seeds. The sausage was some of the best I’ve ever tasted on pizza. Chef Sadri continued making pizzas for the class while demonstrating technique. The one above had lots of veggies, including broccoli. The white sauce was made with ricotta, heavy cream and garlic. I honestly can’t remember what else, but I know there was something. I’ll have to check with Michelle on that. He used WAY more toppings than in my previous pizza classes. Those chefs all seemed to stress the importance of using very few toppings, while simultaneously dissing Americans for their love of piling them on. Chef Sadri did not shy away from toppings. He did talk about the importance of not piling them up in the center of the pizza. 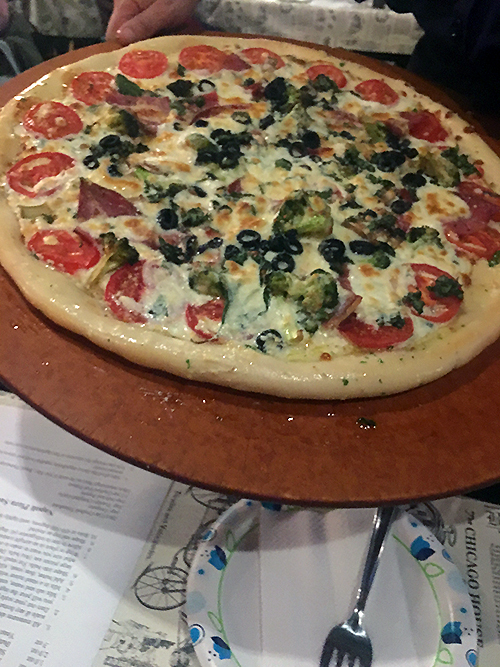 He used a few pieces of toppings for aesthetics, but explained that it allowed the middle of the pizza to cook more evenly and it was easier to cut and pull pieces apart without a lot of toppings falling off. 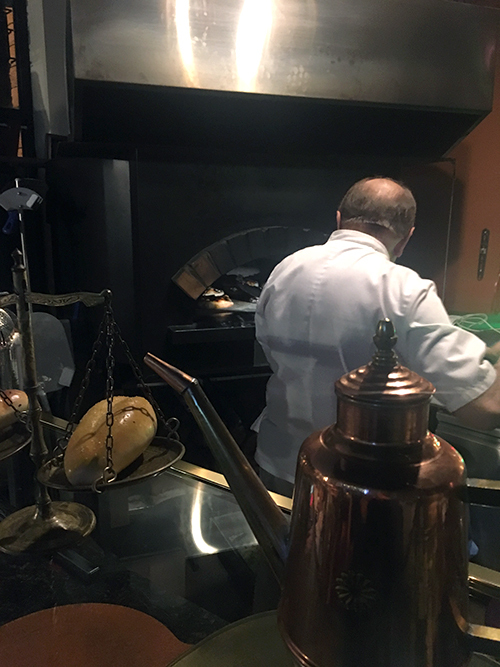 It was really cool to watch him make the calzone. It confirmed that I’ve been doing it all wrong. 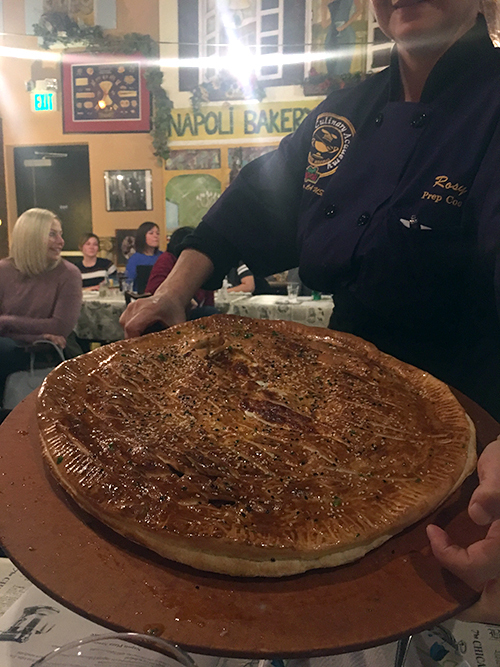 He actually put the filling (in this case – ricotta, spinach, caramelized onion, mushroom, sausage and mozzarella) down the center of the circle of dough. After using egg wash around the edges, he brought BOTH sides up to pinch together. I always fold one side on top of the other and then pinch. Nope, this way was much smoother. He brought both ends together, creating space for the sauce which was something I’ve never done. We didn’t get to taste the calzone since they turned it into the prize for the student that made the best pizza. We all washed our hands and then headed into the kitchen in our aprons to get to work. 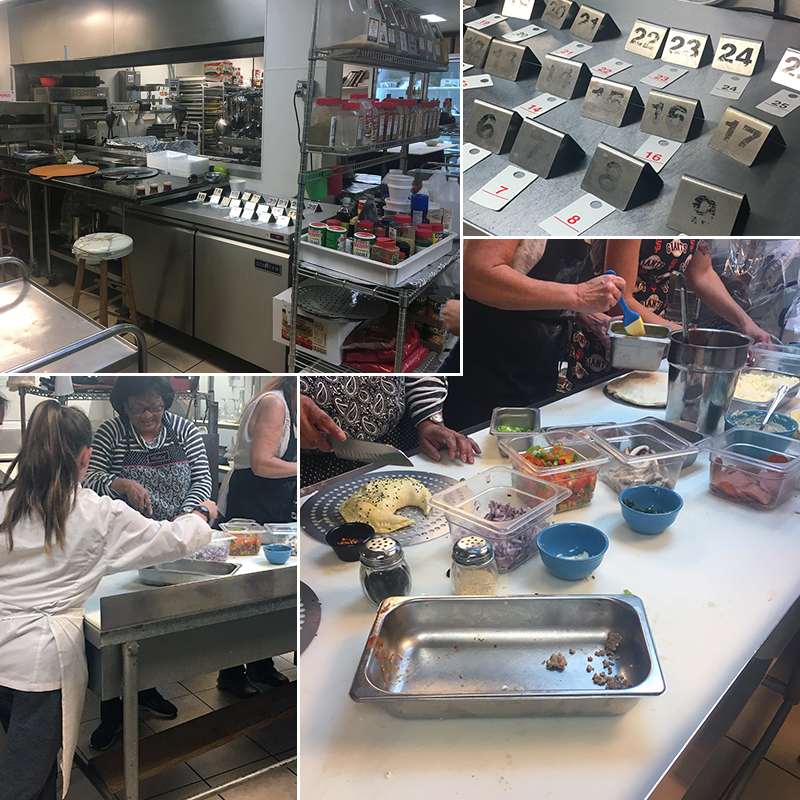 While there wasn’t anything for us to do prep wise (everything was already chopped, the sauce was prepared and the dough was portioned out into balls) we still had fun forming our dough on our pans and getting to choose our own toppings. I’m not going to brag – o.k., yes I am. Michelle and I definitely had the best pizzas of our group. They looked freakin’ amazing. It’s the first time I’ve been able to really get the dough thin enough and to the desired size without ripping it. I even managed to toss it in the air a few times staying very close to my hands, I wasn’t brave enough to toss it high over the table or floor. Now comes the lame part. 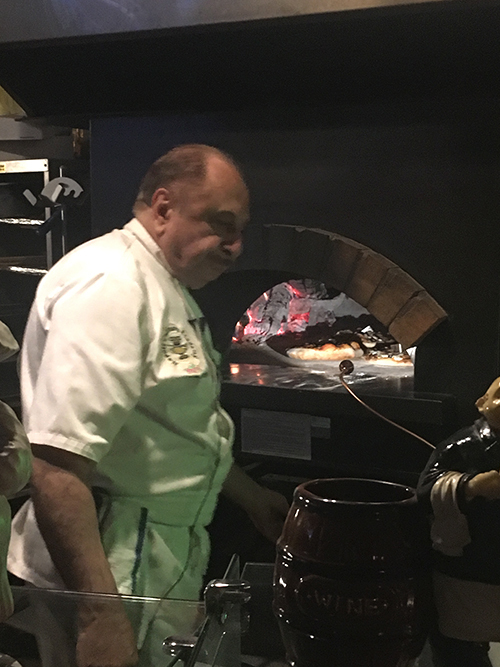 The majority of the student pizzas went into the wood fired oven up front with Chef Sadri critiquing them as they went in and came out. There was only one sauce disaster that he sent back to do over. Ours ended up in the kitchen oven, so yeah, they weren’t part of the contest. WTF? THEN, not only did we miss out on the contest and winning the calzone, they crammed our beautiful piping hot pizzas into styrofoam clam shell containers. Um, excuse me – why did we even bother shaping them into perfectly round pizzas? Michelle and I also think that something happened when they placed them in the back oven because there is no WAY our sauce was even close to the edges where it went over. I forgot to snap a photo of Michelle’s pizza, but it was fabulous too. Whatever, call us sore losers, fine. It was just a disappointing end to an otherwise very fun class. We were full from all of the pizza tasting throughout the class, so we didn’t even try our pizzas until the next day. 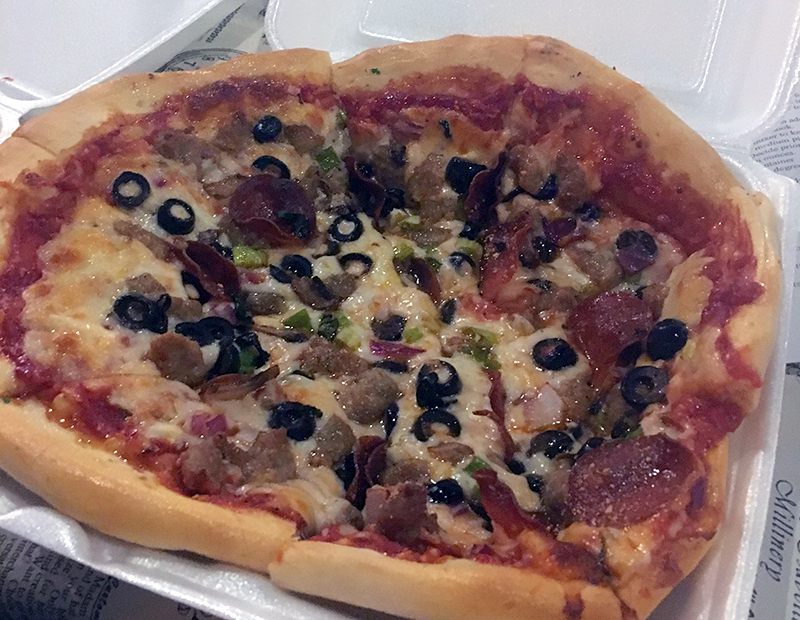 I’m glad that I went all out with toppings (Pepperoni, sausage, olives, mushrooms, green and red onion and lots of mozzarella cheese) – making sure to not place toppings near the center of the pizza, just like we were taught in class. I learned some new tips and tricks and look forward to putting them into action during my next pizza making session. 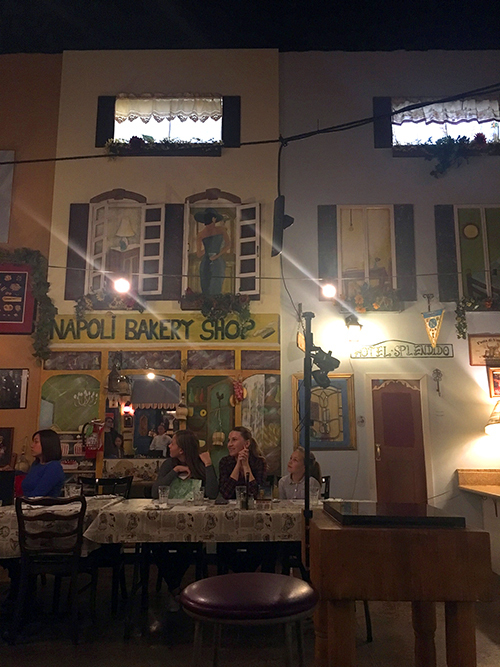 I will definitely consider ordering sausage from Napoli, it was that good! They also sell the fresh mozzarella cheese by the pound and the dough too. The regular price for a class is $156 per person, but the Groupon deal was $21 per person plus a $6 gratuity charge, so a great value for sure. I’ve got my eyes on an Egyptian, African or Persian class for round two. Thanks Michelle for scoring the Luke Bryan tickets and for signing us up for another fun food adventure, I really enjoyed myself.